While the spruce moth bloom this year was marginal, BWO's, pmd's and terrestrial's rule the hatch's. Don't forget pmd pseudo's,bwo's, caddis and stonefly nymphs when choosing flies. Average flow and cooler evening temps have kept the fishing solid. Looking ahead, milder overnight temps and warmer day's should bring on more terrestrials, yellow and tan hopper's, cinnamon and black ant's. Call or stop by the shop in the Big Sky Town Center location for up to date condition's and changes or book a guided trip on the Gallatin, Madison or Yellowstone river's with one or more of our experienced and friendly guide's today!................406-995-4369. The Gallatin canyon continues to fish well with golden stone dries and stimi's. Full blown caddis up and down the river with a mixed bag of pmd's in the late morning and some salmon flies later in the day. Watch for drake's and yellow sallies as well, lot's and lot's of sallies. That being said, the day's of running the banks are going to be limited. Expect to find fish in all water types, shallow fast to deeper, heavier runs. #14-18 soft hackle pheasant tails. Some of the best fishing of the season is upon us. Salmon flies, golden stones and yellow sally's dominate the current hatch's throughout the Gallatin Canyon. Look for late afternoon caddis and late morning pmd's as well. As flows continue to drop expect fewer concentrations of fish along the banks as they move into more traditional holding water. OK!! Here we go folks, we've had some really good fishing on the Upper Madison and on the Gallatin through the high water season, not to mention the Lower Madison. While the snow pack melts away, we're going to see the river's drop fairly quickly making for excellent conditions all around. Look for concentrated fish along the banks. The pocket water along the edges will be loaded with with fish! #8-12 Golden stone nymphs and salmon fly nymphs as well as a host of smaller stone fly nymphs, copper johns, yellow sally's and prince nymphs. Call or stop by the shop for the best up to date conditions or book a trip with one of our many seasoned and friendly guides! 406-995-4369. Ok! With the annual state wide opener upon us, look foward to excellent fishing conditions on the upper Madison. The Gallatin River will be blown out off and on for the next few weeks so call the shop for up to date reports. We've had some fantastic conditions in the afternoon during Mother's Day Caddis mixed with unfishable days as well. Look to the upper Madison and Hebgen Lake tributaries for the next couple weeks for the best fishing. #8-12 Beaded and non beaded Golden stones and Salmon Flies. Orange Egg's between the lakes and in the tributaries. Caddis are out in full force now. Carry some darker bodied #12-14 elk hair's just in case!.......call the shop for current conditions or to book a trip with one of our experienced guides......406-995-4369. Heading into Fall, we've already seen some nice BWO hatches on the Gallatin. Try size 16-20 Blue Winged Olive parachute's and comparadun's. #16 Grey Klinkhammer's and Royal Stimi's are great pattern's through the hatch as well. Look for BWO's to come off in the mid to late afternoon in the canyon. With cold/wet weather moving in this weekend, the river conditions could change quickly. Stop by our NEW Big Sky Town Center location for great sale items and up to date changes and information.......(406)-995-4396. Streamer fishing on the Gallatin can be challenging but very rewarding. Try Copper Zonker's, olive sculpin pattern's like Montana Mouthwash and Montana Gum Disease. Also try Iced-Out Sculpin's and Shultzy's Sculpin. The Gallatin River is fishing well with size 12-14 Spruce Moth pattern's in the morning through the afternoon in the Canyon. This is some of the best dry fly fishing we have this time of year. No telling how long this bloom will last but it has certainly been one of the biggest bloom's in recent memory. We're also seeing lot's of 12-16 size yellow and tan hopper's and too many ant's to mention. Try fishing royal body stimi's and trude's size 14-18 in the evening and 16-18 rusty spinner's. Size 16-18 elk hair caddis(tan) and 14-16 Klinkhammer's both rusty and grey. Streamer fishing should pick up on Gallatin in the coming week's. Try size 6-8 olive sculpin's and copper zonker's in the deeper, heavier run's in the afternoon's and slower deeper flat's and tail-out's in the morning. Nymphing with size 14-18 softhackle lightning bug's and pheasant tail's, size 8 Knotty girl's, size 10 coffee rubber leg's and and a good mixed bag of size 18 beatis pattern's will produce solid fishing throughout the day. .
Expect colder temp's and lot's of rain this weekend. Call 995-4369 for up to date changes and current info or stop by our Town Center location at 32B TownCenter Rd for great deal's and sale's. Nymphing with size 14-18 softhackle lightning bug's and pheasant tail's, size 8 Knotty girl's and and a good mixed bag of size 18 beatis pattern's will produce solid fishing throughout the day. Spruce Moth's have made there first bloom in the Gallatin Canyon and should make for some fun dry fly fishing in the coming day's. Look for morning flights..(when the sun hit's the trees!) in the canyon and up through the tributaries in the Big Sky meadow village. Size 12-14 Moth pattern's. We are starting to mix in some size 18 baetis pattern's as well. Try nymphing in the heavier run's with smaller classic's such as lightning bug's and flashback's. Try Rogue Goldens in the afternoon's with long droppers(2.5 ft on 4x) in more broken riffle water away from the banks in the bigger runs.. Warm and dry condition's have also produced some early terrestrials like size 14-16 black ants and 14-16 Yellow and Tan Hoppers. The Gallatin River has really shaped up through the high water season. We're fishing a variety of golden stones and salmon flies on top. The Gallatin has shaped up nicely through the high water season. We're catching fish on a variety of patterns along the bank's and in the bigger, deeper hole's in the canyon and through the upper stretches to the park boundary. Don't forget a variety of san juan worm's, pink, red and wine colored. Size 10 Black Woolly Bugger's and Grizzly Bugger's are usually a sure bet to move some bigger fish in the river as well as the Yuk Bug when the river is a little dirtier than usual. Reynolds Pass down through MacAtee Bridge has seen some truly great streamer fishing mixed with solid nymphing along the banks. Fish with Black Woolly Bugger's and a variety of stone fly nymphs and rubber legs size 4 - 10. Size 6 Copper Zonker's and size 4 Miracle Mile Sculpin are a sure bet to move some bigger trout. This high pressure might not be ideal for all skiers, but the fish in the Gallatin are loving it. They're staged up in classic winter holding patterns and actively feeding on eggs, stone flies, and midges. The structure that's fishing well is blatantly obvious in these low flows, and that also means it's time to chuck that nicked-up nylon leader that you tied on last June and pick up a fresh fluorocarbon rig. Our new shop in the Town Center is fully stocked with all the gear, tackle and know-how you need to get out there and slay 'em! 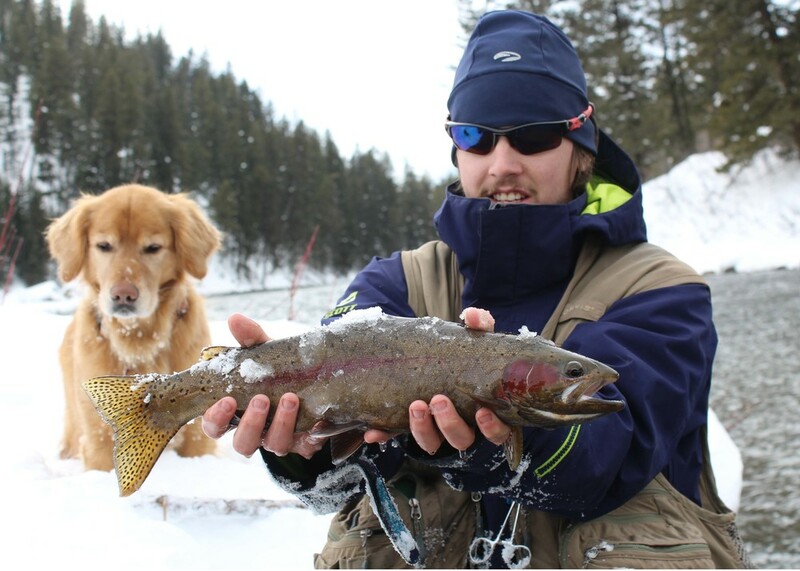 Henry the dog and East Slope guide Spencer Crider striking a pose with a beautiful Rainbow from 1/14/2014. Bye-Bye Summer, Hello Size 18 BWO! The fall blue wing olive hatch is in full swing! With the lower overnight temperatures and shorter days, the bugs are coming off, the trout are super active, and fishing is hot. Fishing will be best from noon til 5. On the surface toss a size 18/20 Compara-Dun, Sparkle Dun, or Bunny Dun. For a nymph dropper, tie on a size 16-22 Flashback Baetis or size 16-18 soft hackles. For an added challenge or the opportunity for bigger fish, try streamer fishing with a size 6 to 10 olive or black Bow River, olive wool-head sculpin's and zonker's, copper and natural.